Whenever I open up the pages of Country Living, I'm impressed. I feel like it's a magazine written for me! Every house tour is incredible, their product finds hit the spot and I love all of their recipes. And this month was no exception. In fact, as I sat by the pool this weekend and flipped through the latest issue, I literally couldn't stop "oohing and ahhing" over an article that toured a beautiful, rustic North Carolina lake house. Lots of "Babe! Come look at this!" and "Ohmygosh we could do that!" were heard, that's for sure! Emily Knotts, the homeowner, renovated her kitchen for... $31. Yup, just the price of a gallon paint! Emily's husband, Michael, built this amazing table for $11. $11, people!! Their living room is filled with so many amazing finds + projects. See that rustic shelf? Emily made it for $4! Hello, we could all do that! Beautiful. This entryway melts my heart. The painted white floors... the metal pail... the old windows. Yeah, I'm gonna need to recreate this one day. Yes, she DIYed the numbered stairs, sliding doors and barn door desks. Genius! Now can you see why I'm absolutely smitten with Emily and Michael's home? So many beautiful images and, even more exciting, inspiring projects! I love seeing DIY design look high end. It's so refreshing! To see more of Emily and Michael's house, check out the article in the latest issue of Country Living or on their website right here. Psst! I started a new series on BabyCenter today. I'm asking all of you lovely readers to help me vote on certain items to design a nursery! Oh yeah, sounds like a good time, right?! Incredible! And the fact that most of it was DIY'd on the cheap is amazing. Such simple ideas with HUGE impact against that white palette! What a talented couple and gorgeous home! Thanks for the tour, Michelle! OMG...I saw this in Country Living and was amazed at how dang cute it was!!!!! so gorgeous!! love all the Diy inspiration here!! I always steal my mom's Country Living whenever I'm at her house. They do have great stuff. This house is amazing! I'm going to go read the article now! Gah. I just love her home. All of it. It's just so beautiful. Hoping a client I have will number her stairs}. LOVELY. Their home looks amazing. No wonder you were oohh and ahhing! :) I love the map too! and that dining room! they built that table for $11?! I need to learn some tips from them for sure. Wow! This house is so inspiring...makes me want to paint all my walls white. Love, love, love the salvaged office doors. Thanks for sharing, Michelle! i just saw these pics too and adore them...those crates in the kitchen island, the numbered stairs....all have me swooning! thanks for sharing! I'm in LOVE with that dining room. Although all of the rooms are amazing. I think the last picture is my favorite! But the whole house is adorable! Dude I still can't get over the $11 price tag. I am always amazed by people who can do such beautiful things for such a low price! I need to go back and stare at those pictures again! I was loving this part of the magazine, too. Country Living is one of my favorites, and this one seemed so attainable. Although, I have to say that she really has an "eye." Love that! Such an incredible space. I would have never have guessed the prices of some of those items. $11? That's crazy talk. Oh yes I fell in love with that home too - the staircase especially. The numbers are so fun and happy! This home is amazing. How can you not love it?! 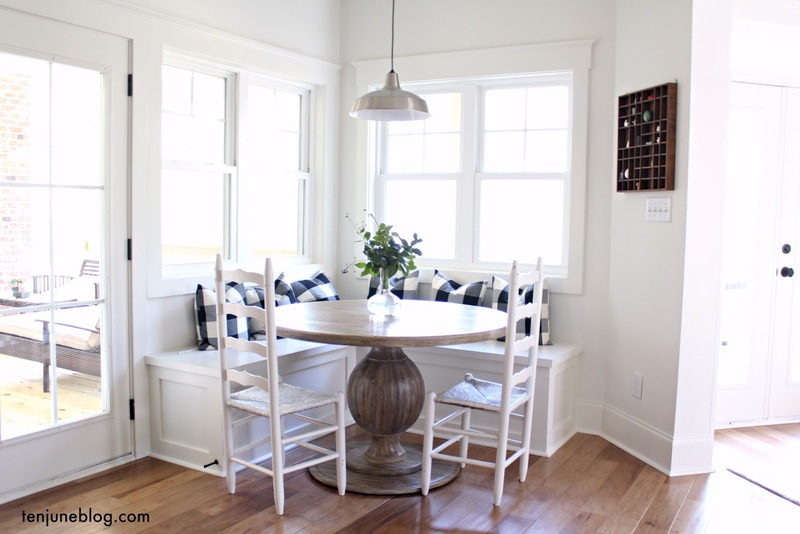 It's so cozy and welcoming- that reclaimed wood dining table...yes please! Beautiful home!! But I want to look that cute and sunny in my white jeans and sandals!!! The disgusting truth. I got so excited to see these images and prices that I started to feel like I might be sick. Yep I am posting this anonymously. That is such a gorgeous home! How cozy! I love how much natural sunlight fills that home!